For a few years, users have asked “Is it possible to have Quickhash import a list of existing hashes and then have it flag files that are known or unknown to the hashlist?“. And for several years I have replied with “One day, I will add that. You’re not the first to ask“. Well, I am pleased to report that with a little free time over Christmas and an hour here and there, I have, at last, managed to add that functionality! The new beta2 of v3.0.0 (just released) has a “Load Hashlist” tick box which, when clicked, displays a button that will enable the user to navigate to a TEXT file containing hash values. 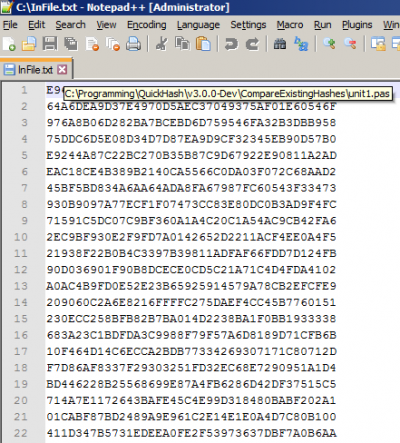 The text file must contain ONLY hash values – no row headers and not other columns. Just one column of text which must all be hashes. On selection, Quickhash will then ingest that list very quickly (200K rows in less than 1 second on most modern computers) and hold it in memory in an efficient hashlist storage mechanism designed specifically for this purpose. Then, when the user selects a folder containing files, and after first ensuring the radio box on the left is set to the same hash types as the user has in their list (e.g. SHA-1, SHA256 or whatever), the program will compute the hashes and at the same time work out if that computed hash exists in the imported hash list. If it does, it adds “Yes” in a new column to the far right, or “No” if it is not found. which will remove either all the ‘No’ values or all the ‘Yes’ values. The user can then copy the result to clipboard or save the result to a file. Version 3.0.0 of QuickHash was started in October 2017, and getting it nearly finished has been very hard and required a lot of work. I keep trying to squeeze an hour here and hour there but it is proving tricky. I hope to get the final v3.0.0 out very soon though and for now, the Beta2 IS HERE. There have been no bug reports to the Beta1 which I released a few weeks ago just before Christmas, so that is promising. So I just need to resolve some cross platform issues now, update the user manual, and then I hope for it to be ready. Bye for now, and stay tuned for the final release of v3.0.0.